Vidyut Jammwal, one of the top 6 global martial art artists in the world, is all set to uplift the action standards in Bollywood with his next family adventure- Junglee. The action star, known for unprecedented agility will be seen performing never-seen-before action stunts. Animal flow is a part of Kalarippayattu and Vidyut will be seen basing his stunts on the same. The actor will be seen fighting poachers on moving bikes, cranes placed at great heights. In one of the scenes, Vidyut is seen fighting the cops with one hand handcuffed to the table. Adding to high-risk action, the actor also shot with deadly Kalarippayattu weapon Urumi and live wires in the film. 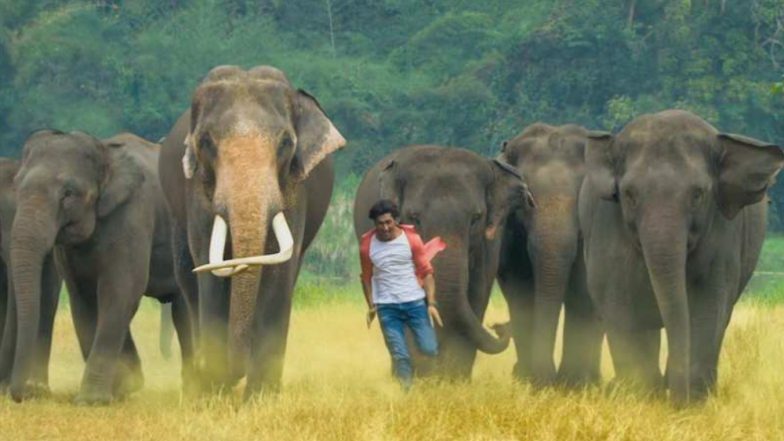 Junglee: Not Vidyut Jammwal, the Elephants Were the Real Stars of the Shoot! Credited for additional action choreography, Vidyut is set to deliver a treat for his fans with action-packed Junglee. Junglee Star Vidyut Jammwal Teaches Us On 'How to Befriend a Python' in This Jaw-Dropping But Adorable Video! He talks about a series of sequences in the movie that made him push the envelope when it comes to his on-screen stunts. "It was an unusual situation for me to fight off three baddies, hand-cuffed and I had to come up with an innovative solution to carry off the stunt. Since there was a table around, I decided to use it to leverage myself in the air and use the body of a man standing by me, to reach to the other, and then the third. The difficulty here was not to hit the guy too hard on his chest while using him to move forward. It required perfect timing and arm-leg coordination,"
This action sequence was in a car and since in the past I’ve got out of the car window in different ways, the only twist I could think was backflip. I’m proud I pulled it off. It was tough because you can’t see anything that’s there behind you as you wriggle out of the small hole. It required calculations and instinctive estimation. We did many takes from different angles, it wasn’t easy to get out. In Kalaripayattu it is important that you use your whole body. And if you can do something with your right hand well, you are supposed to be able to do it with your left hand in exactly the same way. The idea here is that a human being can do the same thing with both sides of the brain. That’s the reason I have swords in both my hands and had to use them simultaneously. There is this action sequence with me riding the bike when I am attacked by a villain who is brandishing a nasty-looking sword. To ward him off, I had to do a backflip and land behind the bike. It was an important scene and required around 30 takes because sometimes the bike would fall and sometimes I would fall myself, to right or to left, as I tried a somersault that would help me land on my feet, at a right angle at the bike. Phew! I got injured during this sequence. I was wearing a safety harness but I miscalculated the jump from the third floor and hit my head on an iron rod. There was a sudden rush and I sensed blood dripping. I could see people gathered on the floor below as I hung on for five minutes. Once I was back on feet, I was rushed to the hospital, I got stitches on my head and returned to the set to carry on from where I had left off. Junglee has been directed by Chuck Russell, who has made movies like The Mask and The Scorpion King in Hollywood. The movie is slated to release on March 29.